We Only Offer The BEST In Gutter Products! 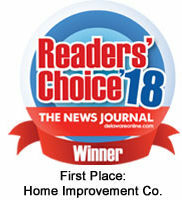 Ferris Home Improvements believes in providing our customers with the best gutter guards in Wilmington DE. That’s why we offer the following products for updating your home or business property–they’re products that we love and use on our own homes. Contact us for expert gutter installers in Delaware. Seamless gutters have become an industry standard for upgrading your gutter system. Much like the vulnerable areas of a roof, the vulnerable areas of your gutters occur when separate materials come together. These joints, common in older or more basic model gutters, make these jointed gutters more vulnerable than seamless gutters. The fewer the joints, the smoother the finished product, and the lower chance of debris collection, leaking. Gutter guard installation helps keep natural debris from collecting in and clogging your gutters. Our Wilmington DE gutter installers company offers a variety of products, but our best and most popular gutter guards are listed below. Click below to read more. Don’t see what you’re looking for? No problem –just ask us and we can discuss other options for you. Rhino Gutter Guard is a stainless steel micro-mesh over a honeycomb aluminum frame that tops the industry for strength, resistance to sticking debris, and product lifetime. This gutter guard’s patented technology literally makes a regular gutter better by providing more stability to its frame and by maximizing its ability to channel water quickly off and away from your home. Rhino’s superior ability to resist debris collecting to its surface ensures the gutter is able to do the job that it is on your home for–catching water! Its screw-in installation prevents it from blowing off of or into your gutters, a risk that many other competitors runs due to their less-sturdy construction. In addition to it being the superior gutter guard on the market, it is also completely manufactured in the USA. The RHINO brand gutter protection system was developed after years of research and experience in the gutter and gutter protection industries. This experience was used to create one of the most technologically advanced gutter protection systems on the market today. From the micron size of its stainless steel mesh, to the degree of slope on the product surface, the Rhino Gutter Guard system is a product that truly stands out above the rest. Rhino has become the industry standard because you will encounter fewer failures, a greater ease of self shedding than any other comparable products and a larger amount of water dissipation (Rhino’s test stands max out at 4.5″ of rain per minute with no overflow). Plus, with Rhino you get the added benefit of a product that can increase the longevity of your gutters and provide box-like strength. We have been manufacturing and designing roll forming machines for gutter protection systems since 2002. It is a difficult process that has taken us years to perfect. Because of this explicit understanding of these processes, we are able to manufacture our products so efficiently that our overhead is substantially lower than our competition. The resulting savings are passed directly to our contractors, who in turn pass those savings on to the homeowner. You will not find a better value anywhere else in the market. For more detailed information about Rhino Gutter Guard, please click the logo below to visit their site. Rhino Gutter Guard brands are the finest quality products available today. Years and years of research and real world experience have gone into the creation of these products and each style has unique features and benefits that just make sense. RHINO manufactures all of our products in the USA and we remain “better then competitive” in comparison to the overseas suppliers through innovation, automation (labor reduction), lean initiatives, and state of the art high speed machinery, which we design and build “in house”. RHINO products employ high tech quality control procedures that allow them to boast of an unprecedented defect ratio, unmatched in the industry. The micro-mesh products we offer are defined by our patent pending process of “hemming” their mesh around the substrate BEFORE roll forming the shape. The process allows RHINO to be the ONLY manufacturer that can claim that their mesh is in constant contact with the substrate due to lateral tension achieved, further augmenting water dissipation qualities. Gutter Guards help keep natural debris from collecting in and clogging your gutters. We offer a variety of products, but our two most popular gutter guards are listed below. Click below to read more. Don’t see what you’re looking for? No problem–just ask us and we can discuss other options with you. Another example of how our Wilmington DE gutter cleaning company attends to details designed to help preserve your home’s beauty and function is the type of gutter hangers we use and how we install them. Whether we install new hangers for your new gutter installation or for your gutter repair, we prefer to use hidden, screw-in gutter hangers for a sleek look that lasts. Gutter spikes are the cheaper, more basic installation method for the gutters on your home, anchoring your gutter with long nails into the fascia and rafters, if accessible. However, gutters weighed down over time with leaves, twigs, ice, or excess water due to clogged gutters, will eventually pull the spikes out over time (pictured to the left). in addition, if this low-quality method is installed with fewer than adequate spikes along the run of the gutter, the gutter can fail in much less time. The Ferris Home Improvements team, however, uses hidden gutter hangers(pictured to the left) as the method for installing your gutters, due to its superior hold over time. These hangers use a screw versus a spike for a more sturdy grab in the wood, and they are also invisible from street level because they do not require puncturing the front of the metal gutter. Also, due to the fact that you are not required to puncture the gutters throughout the length of the run, there are no holes in the front of the gutters, and fewer areas for a potential leak, avoiding the Dangers of Bad Gutters. Ferris Home Improvements prides ourselves in delivering outstanding service at an affordable price; we provide the same services as the area’s largest roofing/siding/windows/etc companies for a fraction of the cost. Most of our business is referral-based, so we save significant money on advertising, and our smaller, non-franchise company structure also saves us significant overhead costs as well. So what do we do with all of these savings? Pass them on to our best investment—our customers! Neighborhood Roof & Siding Rates. Have a group of neighbors in your community that need a new roof or siding? Why not work together to get a better rate? Ask us about special pricing for three or more homes in your neighborhood. This rate is by far our best! Exterior Overhaul Package Rates. 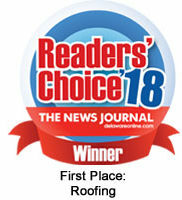 Need a new roof, siding, soffit, fascia, AND gutters? If you contract us for multiple exterior updates at one time, we offer you significant savings. One Newark, DE customer who completed an entire exterior home renovation with us (roof, siding, soffit, gutters, and fascia) reported a cost difference of $15,000 between our bid and a larger company in the area. Be sure you are not paying thousands extra only for a big name—Ferris Home Improvements will give you the same, great results for a more affordable price, often saving you thousands of dollars! Financing. Can’t afford the entire bill right now? Would you rather make monthly payments? We have partnered with Service Finance Company to offer financing up to $25,000 for eligible customers, and we’ll work with you to help you get the services you need.